Exciting news for fans of Patrick McGoohan's performances has reached The Unmutual Website, with the announcement that the 1962 film "The Quare Fellow", which stars McGoohan and Sylvia Sims, is to get its first DVD release on October 22nd 2006. Adapted from the Brendan Behan play of the same name, McGoohan plays the lead of Prison Officer Thomas Crimmin in the film, who becomes entangled in an affair with the wife of a condemned prisoner. 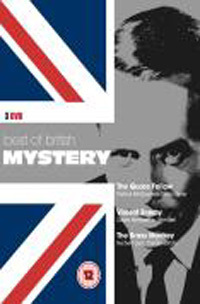 The film is included, alongside the screen classics "Brass Monkey" and "Violent Enemy" on a box set entitled "The Best of British Mystery", available from play.com for only £15.99. Thanks to David Jones for this news item.